This January, Forest Unlimited will be planting approximately 1,300 one-year old redwood seedlings for reforestation and erosion control in a community forest in the hills west of Cazadero. The planting dates are Friday, January 8, 2017 and Saturday, January 9, 2017. On each day, we will rendezvous at 8:15 a.m at Duncans Mills. The seedlings average about 16-inches in height (root ball included) and are not difficult to plant. All equipment and a free indoor lunch, including drinks and snacks, will be provided. Vegetarian food will also be available. To properly plan for this event, it is essential that you contact us and sign up for the date(s) of your choice. To sign up and/or to ask any questions, please contact Carl Wahl, Project Manager, at 874-9268 or carlwahl3@gmail.com. Further information on the rendezvous location, appropriate attire, etc. will be sent to all volunteers by mid December. Please mark your calendar, tell your friends, and thanks. Santa Rosa City Council and business leaders’ plan for the old courthouse square began to be evident in February 2016 as the first 20 of 91 trees to be removed were cut. The claim is that it’s the best plan to revitalize downtown. Revitalization efforts come at the cost of the lost of many mature trees to allow for more parking and widening a road. Th e fight to save majestic coastal redwood groves in California has been waged for more than a century, starting with the campaign that created Big Basin State Park in 1902. In 1978, the Sierra Club dubbed its successful campaign to expand Redwood State and National Park the “last battle”of “the redwood war,” but the battles to protect this globally recognized icon of nature would only intensify. n 1985, a junk-bond dealer named Charles Hurwitz engineered a hostile takeover of Humboldt County’s most respected logging company, Pacific Lumber, and folded it into Houston-based investment company Maxxam. Meanwhile, Louisiana-Pacific, a Georgia-Pacific spin-off, was cutting its more than 300,000 acres in Mendocino and Sonoma counties at roughly three times the forest’s rate of growth. 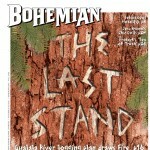 This year, a new redwood battle has emerged, this time in northwestern Sonoma County. Gualala Redwoods Timber (GRT), owner of 29,500 acres in northwestern Sonoma and southwestern Mendocino counties, plans to log hundreds of large second-growth redwoods in the Gualala River’s sensitive floodplain. The “Dogwood” plan encompasses 320 acres, making it the largest Gualala River floodplain logging plans in the modern regulatory era, while the “Apple” plan features 121 acres of adjacent logging and 89 acres of clear-cuts. 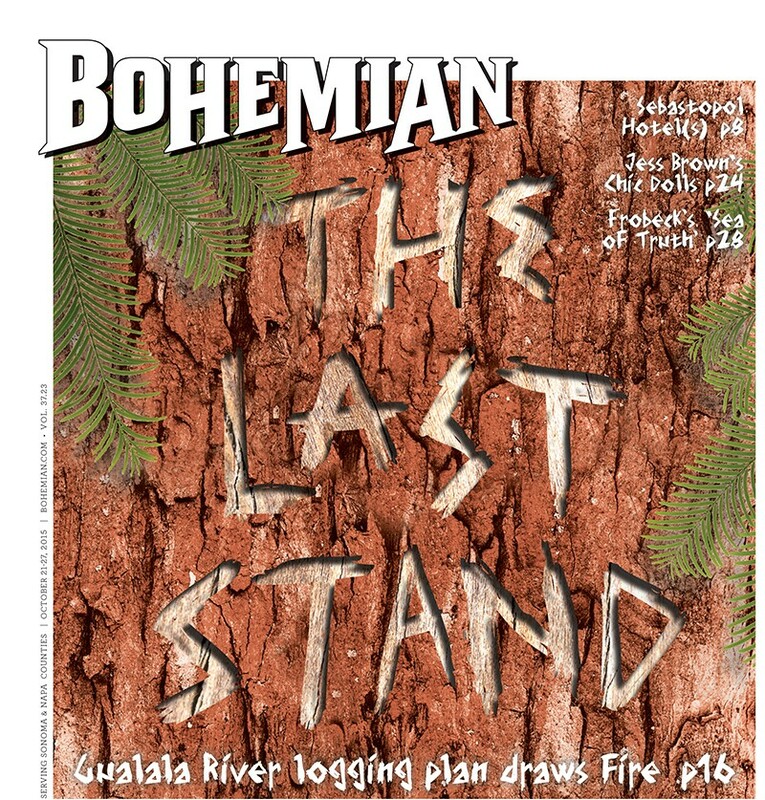 Project critic Peter Baye, a coastal ecologist affiliated with Friends of the Gualala River and a former California Department of Fish & Wildlife regulator, says the style of logging GRT has planned is liable to batter the watershed’s badly impaired “off-channel” salmon and steelhead habitat. He also fears it will jeopardize endangered species such as the marbled murrelet and northern spotted owl, and set a dangerous precedent that erodes the intent of modern environmental statutes that are supposed to protect floodplains. River has been “impaired” due to sediment caused by logging. River has been “impaired” due to sediment caused by logging. Defenders of the plan include the state regulator who signed off on the logging proposal. The outcry from environmental organizations, including Friends of the Gualala River and Forests Unlimited, as well as more than 80 public comment letters by local residents, has led to an intervention by State Sen. Mike McGuire and U.S. Rep. Jared Huffman. The lawmakers asked that the agency that reviews timber harvest plans (THPs), the California Department of Forestry and Fire Protection (Cal Fire for short), to order that Dogwood and Apple be resubmitted due to reported administrative errors. Meanwhile, Sonoma County’s regional parks district has eyed the area as a possible river park site for more than 50 years, while a consortium of conservation groups is seeking to buy the land and create a “working community forest” characterized by a lighter-touch approach to logging. There are other elements of this story that recall past redwood battles. Earlier this year, the property was purchased by the Burch family of San Jose, whose West Coast timber franchise spans three states and variously goes under the names Redwood Empire and Pacific States Industries. To tell this tale fully, you also have to mention a man named Henry Alden, who, as GRT’s forestlands manager, designed the Apple and Dogwood plans. Certainly no stranger to sagas of upheaval and controversy in redwood country, Alden was Maxxam’s lead forester in the late nineteen-nineties as it sought to fell the Headwaters forest. “Nothing in the last 10,000 years, probably a million years, has ever duplicated the degree of disturbance in the Gualala River watershed as has occurred since World War II,” Higgins says. At the time of Euro-American settlement on the West Coast, the board foot volume of coastal redwood forests averaged 100,000 to 150,000 per acre, according to estimates by biologists. Exceptional stands, such as those that grow in rich alluvial soil deposits in areas like floodplains, contained more than one million per acre (enough to build about 50 houses with five rooms each). But the settlers quickly sought to capitalize on the enormous forests stretching around them. The government seized lands from native peoples without compensation and converted them to private property through giveaways and auctions. From the Gold Rush through the early 1920s, settlers hacked half of the original redwood population, with a big chunk of that wood going to rebuild San Francisco after the 1906 earthquake. At the turn of the 19th century, 100 percent of redwood forestland was privately owned. By the 1990s, the board-foot volume of Louisiana-Pacific’s heavily cut-over Mendocino and Sonoma county properties averaged a paltry 10,000 per acreâ€”less than 10 percent of their original volume. Environmental activists and some foresters have embraced the term “liquidation forestry” to describe Louisiana-Pacific’s practices, which remained prevalent in most areas of redwood country well into the 1990s, and continues to be practiced in some areas. The most heavily criticized logging technique has been clear-cutting, which involves razing every tree in a large swath, an ecological trauma that perhaps only a tsunami or volcano can match. These methods, critics say, allow big timber companies to get their money out of the forest as quickly as possible while rapidly degrading the forest and yielding less revenue and fewer wood products over the long-term. The Gualala River watershed includes the redwood-studded mountains above Fort Ross, Stewarts Point, the Sea Ranch and the town of Gualala. Louisiana-Pacific owned 7,000 acres of the watershed, which have been purchased by Mendocino Redwood Co., a firm owned by the billionaire Fischer family, owners of The Gap. Willits lumberman Rich Padula, owner of a 79,000-acre tract spanning the Gualala and Garcia river watersheds, took liquidation forestry the furthest in the watershed, diminishing his lands to less than 4,000 board-feet per acre before attempting to convert a large portion of his holdings to wine grapes. Before the Burches purchased their land in March it was known as Gualala Redwoods Inc. (GRI). GRI’s owner has degraded its lands but not to the same extent as Padula. But the company has drawn criticism from environmentalists for its rapid cutting rates and reliance on clear-cutting. According to a 2010 Cal Fire report on sustainable forest management, the average annual California timberland harvest covers 1.64 percent of private timberland acres. By contrast, GRI’s total logging since 2004 has covered about 30 percent of its land, which translates to a harvest rate of nearly 3 percent per yearâ€”almost twice the state average. Company representatives contend that their logging practices are not environmentally harmful and deny that they have had a detrimental impact on the watershed. They point to road upgrades that reduce soil erosion into streams, as well as stream restoration work they have conducted in collaboration with a group called the Gualala River Watershed Council. Not long after I met Friends of the Gualala River president Chris Poehlmann outside of Gualala Point Regional Park in August, he pulled glass display cases of live termites gnawing on chunks of wood out of the trunk of his 1982 Mercedes Benzâ€”which he converted to run on vegetable oil. Poehlmann, who lives in Annapolis and builds museum displays for a living, constructed his first live display a few years ago for the California Academy of Sciences. He soon discovered that the much-maligned wood-consuming insect makes an effective prop for promoting his sense of wonder about the natural world. Poehlmann got his start as a forest advocate when GRI sprayed jellied gasoline (aka, napalm) on land they had clear-cut just beyond the eastern edge of the Sea Ranch in 1989, prompting a surrounding section of forest to catch fire. The idea was to clear brush to give sunlight to the new redwood seedlings that would be planted. Alarmed by these practices, Poehlmann started his work monitoring and critiquing timber havests in the area and joined with Friends of the Gualala River soon after. A timber harvest plan (THP) serves as a scaled-down version of an environmental impact report. Members of the public can file comments on THPs, but only certain agencies, not individuals, can appeal them under state law. Poehlmann and others began working to oppose GRI’s logging plans based on what they saw as cumulative impact on the Gualala River ecosystem. There is no escaping the inexorable judgment of weather and time. Every year, the rain renders its verdict on historic logging activities in watersheds like the Gualala. By removing vegetation that anchors hillsides, and constructing spider-web road patterns, logging causes erosion that contributes to the degradation of rivers and fish habitat. Sediment smothers fish eggs and disrupts the reproductive cycle. Fish, especially salmon and steelhead, require pools where they can rest and feed. Erosion fills in those crucial pools. The EPA later listed the watershed as impaired due to elevated temperatures. In the 2000s, the Conservation Fund, a land trust based in Virginia, purchased Padula’s former Gualala and Garcia river lands, tens of thousands of acres of young-growth redwood and fir in the coastal mountains. This free market, nonprofit experimentâ€””working community forests”â€”calls for limited, sustainable logging as the land slowly recovers. 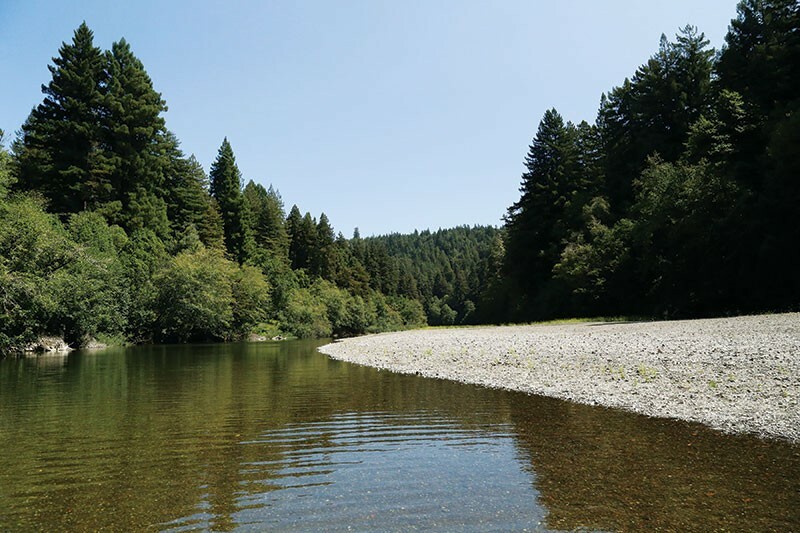 The Fund now owns more than 57,000 acres of contiguous forest in the Gualala and Garcia river watershed, and their land abuts Gualala Redwoods’ propertyâ€”in a suggestive manner, say environmentalists. Partly as a result of these purchases, the Garcia River, which is directly north of the Gualala and roughly the same size, “has been slowly recovering from its years of damage from logging,” says Alan Levine of Coast Action Group, an environmental organization in Point Arena. Through their involvement in these efforts, North Coast environmentalists have quietly built a legacy of successful conservation campaigns that equal or exceed any other part of redwood country. When GRT’s former owner, New Orleans-based physician Ollie Edmunds, put the land up for sale earlier this year, many were hopeful that the Conservation Fund would once again emerge with the land. The Sonoma Land Trust joined the Conservation Fund’s consortium, as did Sonoma County Regional Parks and other entities. While the environmental groups are not affiliated with the organizations trying to buy the land, they are supportive of of these organizations’ “working community forests” approach and the idea of a riverside park. County parks Acquisition Director Steve Ehret would not reveal the terms of the bid they offered but called it a “very competitive offer.” In the end, the Burch family’s bid won out. Because the Burch family’s company is privately held, information about them is difficult to come by. The Burches rarely grant interviews, and Sean Burch, the company’s general manager, did not respond to several requests for comment on this story. “They’ve been in this area for a while, but we don’t know a lot about them,” Ehret says. A review of background materials, including county assessor records, provides a thumbnail sketch. Company patriarch Roger Burch, who lives in Morgan Hill, worked as a police officer in San Mateo County in the 1960s before making it big in timber. He wound up the owner of timberland spanning five California counties, and three mills. Among them is the conspicuous Cloverdale redwood mill at the intersection of highways 101 and 128. Pacific States Industry is the parent company and Redwood Empire is its California division. Apart from its new Gualala holdings, the company owns redwood and Douglas fir timberland throughout northwestern Sonoma County. According to data from the Sonoma County Permit and Resources Management Department, 63,178 acres in the county are currently zoned for timber production. Now that they own GRT, the Burches own more than a quarter of that. But the company’s battles with environmentalists have almost exclusively occurred in Santa Cruz County. In an area above Watsonville, called Gamecock Canyon, they logged some of that county’s only remaining unprotected old-growth and, as a California Superior Court would later rule, illegally used a resident’s easement road to haul logs in the process. A more harrowing incident occurred in 2002, when a tree sitter named Brian Connolly, 31, plunged to his death while occupying a tree Redwood Empire later logged in an area called Ramsey Gulch. “When they first got here they were just awful,” says Jodi Frediani, long-time forestry consultant for the Central Coast chapter of the Sierra Club. Redwood Empire’s largest land-holding is actually in Mendocino County, where it bought 45,000 acres of cut-over former Louisiana-Pacific land above the remote town of Covelo for $300 an acre in the late-1990s. Their immediate neighbor happens to be former Cal Fire director Richard Wilson, 81, a prominent environmentalist who is also a forester. Perhaps nobody knows more about the politics of liquidation logging than Wilson. A Republican appointed by then-governor Pete Wilson, he was the director of Cal Fire from 1991 to 1999, the decade when the Humboldt timber wars burned the hottest. He also helped craft the 1973 California Forest Practice Rules, designed to strengthen protections against streamside logging and compel timber companies to harvest selectively, with something called “maximum sustained production” of timber in mind. In 1999, federal and state monies were used to purchase the 5,600-acre Headwaters tract for a whopping $532.27 million in cash and assets – more than half of the roughly $850 million in inflation-adjusted dollars Hurwitz had paid for his acreage as a whole. As a condition of the sale, Maxxam was required to receive Wilson’s approval of its sustained yield plan. The cut rate that Hurwitz and the federal politicians eventually agreed on was 179 million board-feet per year for the first decade after the signing. The number was based on a computer model created by a private Redding-based company named Vestra Resources. Wilson could not get his hands on the report, although he directed the most important timber-regulating body involved in the deal. Pacific Lumber later claimed the report was proprietary. A decade later, Wilson and a Cal Fire forester named Chris Maranto brought a whistleblower suit against Hurwitz and Maxxam, alleging that Hurwitz had falsified the sustained yield plan to facilitate the Headwaters sale and to enable the ongoing liquidation logging of its land. The lawsuit against Hurwitz, which included the state and federal governments as plaintiffs, was finally heard in 2009 in Oakland. On the stand, Maranto described how he had discovered the deception several years after the fact. The annual cut rate that Hurwitz consented to in the government negotiationsâ€”179 million board-feetâ€”was based on a particular number of trees. But on the acreage he surveyed, Maranto didn’t find anything close to the number of redwoods the company had told the government it had. He soon learned that Pacific Lumber had included a second tree in its computer modeling for all of its holdings: tan oaks, which are almost never used to show marketable inventory because they’re more like weeds in the eyes of the timber industry. Hurwitz’s legal team never denied that the company had used tan oaks in the stocking reports; they simply argued that doing so was legal, and that Hurwitz had no personal knowledge of the situation. After six days, the plaintiffs decided the Bush administrationâ€“appointed judge had put too many limits on what they could enter into evidence, so the odds weren’t good that they would convince nine jurors the tan-oak situation was a scamâ€”and that it came from the top. Wilson and Maranto settled for $4 million from Pacific Lumber, which was distributed among the plaintiffs’ law firm and the state and federal government. Exhibits from the trial reveal that the Pacific Lumber employee who worked most directly with Vestra Resources to prepare the suspect sustained yield plan was Henry Alden, the forester in charge of the current THPs along the Gualala River. Alden has declined multiple requests to comment for this story. Around the time that Alden joined Gualala Redwood Inc. (GRI) in 2000, as the company was called before it was sold to the Burches and renamed GRT, the company proposed to harvest approximately 148 acres in the floodplain adjacent to the fish-bearing North Fork and Little North Fork branches of the Gualala River. The plan, located in the exact same area where the Dogwood THP is proposed, was on track for approval until the National Marine Fisheries Service (NMFS) sent a lette2 2001 to Cal Fire in 2001 opposing the plan. The Board of Forestry and Fire Protection, a nine-member board appointed by the governor that composes the policymaking branch of state forestry, rejected the plan. It’s rare for an agency to appeal a THP and rarer still for the board to uphold it. Timber industry representatives make up three members of the board, a livestock representative fills one seat and a California Foresters’ Association typically fills another. Until Huffman and McGuire intervened, GRT’s much larger current floodplain logging plan passed through the regulatory process without opposition from regulators. Dan Wilson, acting North Coast branch supervisor for NMFS, says there are two differences regarding his agency’s position on GRI’s previous plans and GRT’s current one. One is that Cal Fire has strengthened its watershed-protection guidelines, called the Anadromous Salmonid Protection Rules, which ostensibly strengthen protections of endangered fish. The other is that GRT is doing more to mitigate its potential damage to streams, “especially by placing wood in streams to help create spawning pools and shelter for fish,” he says. This time, his agency has declined to comment on the plan. A 200-foot buffer between the river and logging area is also required, but the floodplain is much wider than that in many places. According to Baye and other critics of the THP, recent science on salmon survival and recovery emphasizes the critical importance of floodplains and assigns a reduced role to woody debris. The proposed THP areas have not been logged since the adoption of modern environmental legislation in the early-1970s. Scouring winter floods have periodically rushed through the river canyons, naturally thinning the lush forests and giving the groves an expansive, cathedral-like appearance reminiscent of other redwood parks such as Prairie Creek Redwoods, or even parts of Armstrong Redwoods State Natural Reserve. GRT and Pacific States Industries declined to comment for this story, so the best available representations of their perspective are in the Dogwood and Apple plans themselves. In the Dogwood plan, overseen by Alden, argues that scuttling the logging plans would only defer the felling of floodplain trees to a later time, while forcing the company to harvest an equivalent volume of timber somewhere else. For his part, Sonoma County Parks planning director Ehret is enthusiastic about an expanded Gualala River Redwood parkâ€”even if the logging will continue on land adjacent to the park. “People don’t always realize that, as time marches, there’s some opportunities you never get back,” he says. Amy Chesnut, acquisitions director of Sonoma Land Trust, says her organization took part in negotiations with the previous owners, as part of the conservation consortium that attempted to buy the property, and that she would “jump at the opportunity” to negotiate with the Burches. The idea is that the Conservation Fund and other conservation groups would complete the largest contiguous area of nonprofit working forestland in the history of the redwood region. When the Burches purchased the property, the harvest plans were already queued up, but Alden waited until after the purchase went through to submit them. The Dogwood THP addresses the possibility of selling the landâ€”a move some observers see as a negotiating ploy. Poehlmann is more pointed in his remarks than McGuire and other parties with concerns about the logging plans. Forest Unlimited has commented on the draft Local Coastal Plan. The county of Sonoma is considering allowing more wine industry development along the coast. In 1984, a researcher named Roger Ulrich noticed a curious pattern among patients who were recovering from gallbladder surgery at a suburban hospital in Pennsylvania. Those who had been given rooms overlooking a small stand of deciduous trees were being discharged almost a day sooner, on average, than those in otherwise identical rooms whose windows faced a wall. The results seemed at once obvious—of course a leafy tableau is more therapeutic than a drab brick wall—and puzzling. Whatever curative property the trees possessed, how were they casting it through a pane of glass? That is the riddle that underlies a new study in the journal Scientific Reports by a team of researchers in the United States, Canada, and Australia, led by the University of Chicago psychology professor Marc Berman. The study compares two large data sets from the city of Toronto, both gathered on a block-by-block level; the first measures the distribution of green space, as determined from satellite imagery and a comprehensive list of all five hundred and thirty thousand trees planted on public land, and the second measures health, as assessed by a detailed survey of ninety-four thousand respondents. After controlling for income, education, and age, Berman and his colleagues showed that an additional ten trees on a given block corresponded to a one-per-cent increase in how healthy nearby residents felt. “To get an equivalent increase with money, you’d have to give each household in that neighborhood ten thousand dollars—or make people seven years younger,” Berman told me.